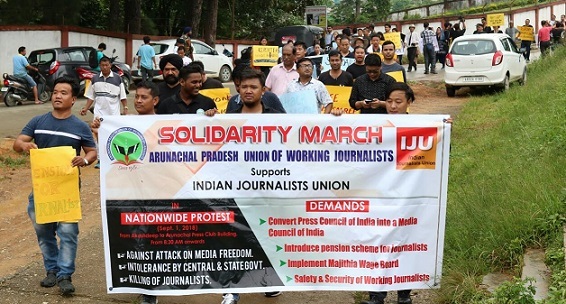 Condemning the ever-increasing curbs imposed on the freedom of press and speech by the Central and State Governments, the scribes of Arunachal Pradesh under the aegis of Arunachal Pradesh Union of Working Journalists’ (APUWJ) took out a massive protest rally at the Capital here on Saturday. The rally, which was taken out to support the call of Indian Journalists Union (IJU) against the atrocities meted down on journalists and media houses, killing of journalists, intolerance of State and Central Governments, saw the protestors walk all the way from Aakashdeep to the Press Club here carrying festoons, placards and shouting slogans that demanded the protection of rights of the media. The demands of IJU which include constitution of a meaningful and independent Media Council of India, introduction of pension scheme for journalists, implementation of Majithia Wage Board and the safety and security of journalists etc were later highlighted in detail by APUWJ president Amar Sangno who addressed the gathering after the rally at the Press Club. Denouncing the continuous attacks on journalists and media houses by the Government, he said the central and state governments across the country were intolerant when it came to protecting the freedom of press. “The Government’s attempt to muzzle free media is like attacking the basis of democracy. Pressurizing media houses and independent journalists to conform to the diktats of the ruling dispensation not only weakens the foundations of democracy in the country but also violates the freedom of expression and people’s right to know as guaranteed under the Constitution,” said Sangno. Dodum also spoke on the dire need to enact the Working Journalists Protection (WJP) Act by all the state governments so as to protect journalists from being soft targets and facing violence. While informing that Maharashtra is the only state in India where an Act to protect the rights of working journalists has been passed, Dodum opined that the WJP Act should also be enacted in Arunachal Pradesh to ensure the safety of scribes who often face daunting situations. Also to speak on the occasion were senior journalists, PK Behera and Taro Chatung, Arunachal Electronic Media Association president Mukul Pathak and Rajiv Gandhi University associate professor, Dr Nani Bath. It was further informed that the APUWJ would be submitting a memorandum to Chief Minister Pema Khandu on Monday demanding the Enactment of Working Journalists Protection Act, Introduction of Pension Scheme for Working Journalists and Implementation of Majithia Wage Board in State. Exemption of journalists from toll and parking taxes and accommodation for accredited journalists at government guest houses would be the other demands of the Union. Arunachal Civil Society chairman, Patey Tayum, Arunachal Students Union Delhi general secretary, Dewan Natung and Consumer Rights Organisation state president, Achu Bagang among others were present in Saturday’s rally.